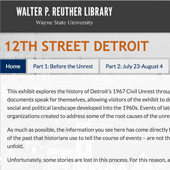 The Walter P. Reuther Library is proud to share a new web-based exhibit to accompany our current atrium display, 12th Street, Detroit, 1967: Employment, Housing, Policing, and Race Relations in Evidence. The web exhibit includes digitized archival documents from our physical exhibit as well as additional items from our archival collections for users to explore. This web exhibit particularly benefits teachers and students exploring the events of 1967, particularly those wanting to understand the civil unrest through primary sources made as events were unfolding by people who were there. It also invites a national and global audience to consider and learn from the evidence created at the time. 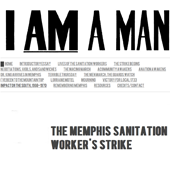 This exhibit tells the story of the 1968 sanitation workers strike in Memphis, Tennessee. During the three-month campaign, the strikers earned support from national leaders, including Martin Luther King, Jr., who was eager to draw attention to the importance of not just racial equality but economic equality for the majority African American sanitation workers. While in Memphis to march with the striking workers, King was assassinated on April 4. On April 16, the City of Memphis signed an agreement with AFSCME Local 1733 to recognize the union, increase wages, and improve working conditions. This exhibit was originally created in 2003 and curated by Dan Golodner. In 2012, It was redesigned, updated, and enhanced, co-curated by Dan Golodner and Johanna Russ, in collaboration with Joshua Neds-Fox and Meghan Finch of the Wayne State University Library System. When a Nation at Risk report was released in 1983, the American Federation of Teachers (AFT) embraced the thrust of the report that said that the United States public education system needed to be fixed, not destroyed. Immediately, the AFT became the leader in developing new education reform initiatives throughout the country. 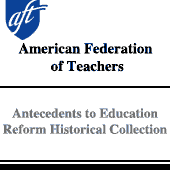 The Antecedents to Education Reform Historical Collection website was launched in 2012 and contains documents from the AFT historical collection that document the role the AFT has had with the modern education reform movement. Some highlights from the collection are the “Toledo Plan” the first Peer Assistance Review program, the Dade County Shared Decision Making program and the Professional Education Program from Pittsburgh. Other documents range from speeches to reports on education reform during the 1980s and early 1990’s. This collection will continue to grow with more AFT primary materials that are related to education reform initiatives. 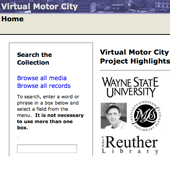 Virtual Motor City is the name of an IMLS sponsored digitization project, carried out by the Wayne State University Library System and the Walter P. Reuther Library. The digitized images in the project represent a small subset of the Detroit News Collection, one of the premier photo-journalistic resources freely available from a national-level newspaper and held at the Reuther Library. This online exhibit is the adaptation of a traveling exhibition that premiered during an event celebrating District 925 in February 2004. Held nearly two and a half years after the SEIU affiliate’s dissolution, the event brought together former members, leaders, and friends of District 925. The gathering provided the venue for discussions on District 925’s historical significance within the labor and women’s movements, and the creation of an archive for the SEIU affiliate’s over 20-year history. The 925 exhibit, oral history project and collection comprise some of the many resources at this research facility from which scholars, students, documentary filmmakers and others can draw as they seek to pursue research about the struggles of women in organized labor. 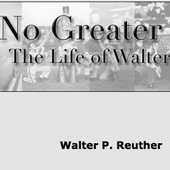 This online exhibit about Douglas Fraser, former President of the UAW and professor of Labor Studies at Wayne State University, is an adaption of an exhibit that was on display at the Reuther Library in 1998, and again (with edits) in 2008 upon his passing. 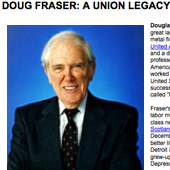 Doug Fraser, whom everyone knew as “Doug,” was a legendary labor leader. Indeed, Fraser was a person respected by auto executives, Presidents of the United States, heads of states from many lands, and American labor leaders. Moreover, he was simply adored by the rank-and-file members of the UAW, who knew Doug was one of them at heart. After his UAW Presidency ended in 1977, Fraser became a highly regarded Professor of Labor Studies at Wayne State University. This exhibit is just a brief glimpse into the vast career of a great labor leader, professor, and friend. This online exhibit about UFW history and the struggles of migrant workers in America was originally developed for print display in 1998. Over the course of several years, pieces of that exhibit were brought into the online environment. Now, in the year 2013, we once again present this venerable resource. 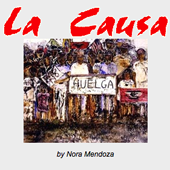 La Causa -- “the cause” -- is the story of Cesar Chavez and the United Farm Workers of America. For over fifty years years, the UFW has organized and provided benefits for migrant laborers and agricultural workers. This exhibit is dedicated to all farm workers who labor in the fields. La Causa es la historia de César Chávez y los Trabajadores Agrícolas Unidos de Norteamérica. Por más de cincuenta años, la UFW ha organizado y provisto beneficios para los trabajadores ambulantes y los trabajadores agrícolas. Esta exhibición está dedicada a todos los trabajadores agrícolas que trabajan en los campos.